Happy Thanksgiving everyone. I'm a few days late on the Facebook Chat recap with James Duff this week due to a family trip to Disneyland, but we're back on track. Joining James this week was Kearran Giovanni and Phillip Keene. Kearran even answered one question directly from her Facebook profile, which was a first for the chat. 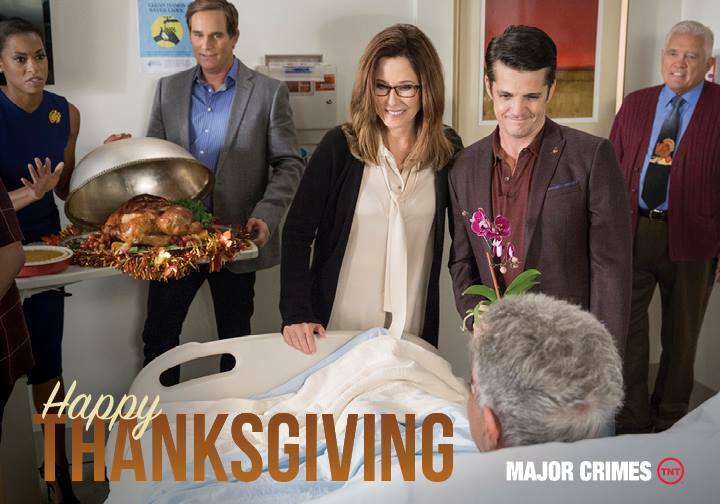 The biggest news happened yesterday: Major Crimes has been renewed for another season. We've all been waiting and glad to see the team will be back next year. More details on how many episodes and when we'll see them will be forthcoming. Here's the link to this weeks entry, in case you need to catch up: Identity: The Other Side of the Coin. Tomorrow on Mystery Playground we will have a special post where Jonathan Del Arco matches Major Crimes with the perfect drinks. And finally here is the chat recap. I've just included answers from James and Kearran since they recap the questions when they respond. James Duff Welcome everyone! All new episode coming at you. Our first Thanksgiving episode ever! James Duff I'm here with Kearran Giovanni, the irrepressible Det. Amy Sykes, and her partner in crime, Phillip P. Keene, Reserve Officer, Civilian Tech, Buzz Watson. James Duff While we're waiting for the page to update, I'll just say that we have a lot of personal story in addition to our mystery tonight. It's part of our holiday ritual. James Duff Ilona Arcari gets us started by asking if we still use film on Major Crimes. We don’t. We are digital and have been since the last six episodes of The Closer, so that the transition would look as smooth as possible. However, the language of film making hasn't changes so much. We still say cut at the end of the scene. We still say print. We still say "Moving on" when the camera changes position. James Duff Lorraine Brown asks if Amy and Malcom Jamal Warner (Lt. Cooper are going to be taking their relationship to the next level. And the answer is probably! Sometimes our stories depend a little bit on the availability of our actors. Kearran Giovanni Ilona Arcari GW influences me on and off screen. He has taught me to see the obvious and use it as a tool. Love love love working with him. James Duff Donna Burns Tucciarone talks about what it was like behind the scenes here during filming, and how much everyone seemed to like each other. That affection is very real. And a few months ago, everyone went to Mary's house for dinner, and then we had birthday parties at our house. When you work with most of the same people for twelve years, you'd better get along! We also went to Kearran's husband's birthday party a month or so ago! And he is really nice. Except the last time the writers got together for a poker game, he kind of cleared the table. You know Kearran's husband is a great guy if he turns up with four Aces and everyone still loves him. James Duff Elaine R asks Kearran how she manages to work so much with two little children. Kearran says "Lots of managing of everyone's schedules and a very understanding husband." James Duff Kearran came to Major Crimes from New York and Broadway where she was known as one of the best hoofers on the boards. She can still kick her foot up over your head. James Duff Nancy G P asks what we're doing with Andy? Sometimes, when police officers get hurt on the job, there are long term consequences. You don't just get over it in a week. Very serious. James Duff People in the box below ask what Kearran is doing for Thanksgiving. She's going home to Texas! I'm from Texas, too, but not going there this year. People ask in the box below this one if the cast is going to share a Thanksgiving dinner. James Duff Tonight's episode also features a terrific scene between Provenza and Flynn in the hospital. It's a little desperate tonight. But I'll just say medical care is a serious issue in this episode. James Duff Andy's doctors is played by Angel Desai, a Broadway actor like Kearran. Angel does a great version of Another Hundred People by Sondheim. Genius! James Duff Sue B says she enjoyed meeting Phillip at an award ceremony for Mary in Palm Springs. Phillip loved meeting you, too, and thought it was a great experience and that Mary was fantastic! 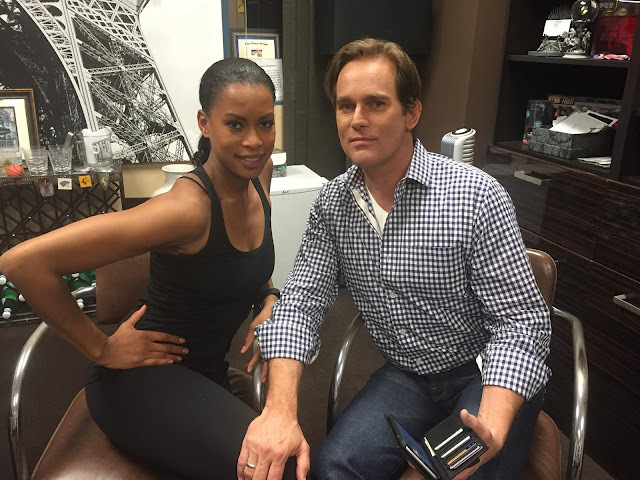 James Duff Graham and Mary probably have more one-on-one scenes than any two actors on the show. James Duff Phillip, Raymond, Michael Paul Chan, Tony Denison and G W just spent the weekend in Florida together raising money for The Sunshine Kids. James Duff One thing I'd like to mention, this is Nick Zaya's first episode as a writer. He pairs up here with the great Jim Leonard, and together they brought us an out-of-the-box holiday show. James Duff See you next week as we hurtle toward Christmas and debut another new writer on our staff, Mike Zara teamed up with the inestimable Leo Geter! James Duff JuLia K asks if we'll ever see Sharon break down. I think if you watch our five parter this February, she has big challenges. James Duff Though this is not generally known, detectives have a pretty hard row to hoe inside the LAPD. They are necessary, they are respected and they are not trusted so much! That's because everyone - everyone - every single person - knows that deceives have to lie all the time. They live in a grayer area than SWAT or the Air Ship pilots or patrol officers. James Duff Lauren G asks if Sharon is still the LAPD's women's coordinator. No, she has passed that job on to someone outside the detective branch of the LAPD. James Duff Provenza has Andy's Power of Attorney for health affairs. James Duff Toni B asks how long a scene takes to film and if it takes a lot of times to get it right. The length of the scene depends a lot on how many people are in it and how much action takes place inside action and cut. Usually, scenes with more pages and characters take longer to shoot. James Duff @Joan R asks where Fritz Howard has been lately. He'll be back very shortly in our December finale. Four weeks from now! Wow! Our autumn season is half over tonight. James Duff Karla O says hello to Phillip and how much she loves Buzz. James Duff Kearran, Phillip and I wish you a great Thanksgiving and I'll see you here next week. Take a look at past Major Crimes Facebook chats. We'll be back tomorrow with a special Drinks with Reads Major Crimes Edition. Until then, you can find us on twitter +Mystery Playground and on Facebook.